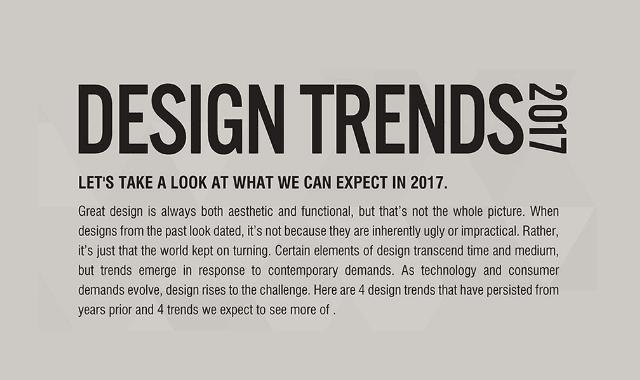 Design Trends 2017 #Infographic ~ Visualistan '+g+"
Great design is always both aesthetic and functional, but that's not the whole picture. When designs from the past look dated, it's not because they are inherently ugly or impractical. Rather, it's just that the world kept on turning. Certain elements of design transcend time and medium, but trends emerge in response to contemporary demands. As technology and consumer demands evolve, design rises to the challenge. Here are 4 design trends that have persisted from years prior and 4 trends we expect to see more of.